Her racing career began, essentially, on a dare. “A year after my first bike race, I got my pro license,” Tingey said. Tingey is a rarity on the professional mountain biking circuit. Not only is she, at just 34 years, one of the oldest racers everytime she lines up, she’s almost always the only mother. Maybe it’s because of that distinction that she appreciates where she is as a cyclist. Though she had raced a little bit as a road cyclist before Kirkham was born – she’d completed LOTOJA a couple of times and was competing in a stage race when she pulled the plug on her season after finding out she was pregnant – racing was not a high priority in her life. She was wrong – and couldn’t be happier about the premature assessment. Tingey, who grew up in Salt Lake City and now calls Las Vegas her winter home while spending her racing season in Utah, was so excited about her finish in the Red Rock Rampage in 2010, she upgraded quickly and frequently with similar success rates. “I found out there was definitely a fire in me,” she said. With the encouragement and support of her husband, John, she has devoted her life to racing. While juggling motherhood and her training schedules places a constant demand on evaluation, cooperation and time management skills, the pro is handling it well. Growing up, Tingey was a competitive swimmer and had dreams of participating in the Olympics. An injury, marriage, motherhood, etc., all forced a change in her outlook but didn’t completely extinguish the competitive flame. But she also still is in awe of how far and how fast she’s come. She’ll be joined in the pro races by fellow new mother Willow Koerber Rockwell at races this year so she won’t be quite so alone in that category. But Tingey still finds herself racing against World Cup veterans such as Georgia Gould, Kathy Sherwin and Heather Erminger. Because the Las Vegas area has a fairly limited racing calendar, Tingey moves back to Utah during the spring and summer to take advantage of cooler temperatures, more races and grandparents that are willing to babysit as she trains. She credits her coach, Lynda Wallenfels, with fine tuning her training schedule and providing a road map to success. She lined up as the only mother in the Mellow Johnny’s race in Texas a few weeks ago and finished 15th in a highly-competitive pro field. She placed 6th at the Bonelli Park U.S. Cup race in March. She’s finding the mountain bike community across the country provides an incredible support network even though she’s not part of huge team. No matter where she races, she’s able to find support from friends and strangers. With support from sponsors such as CarboRocket, Stan’s No Tubes sealant, ESI Grips, Julbo glasses, Mountain Velo and Lazer Helmets, Tingey said she feels well prepared to tackle the 2012 season as she focuses on key races such as the Mt. 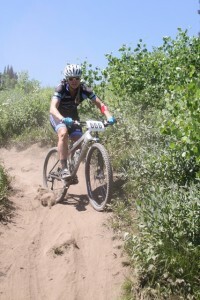 Ogden 50, the Park City Point to Point and others. Her family life revolves around bike races. Family vacation must be planned around and including races. Family reunions, too. “I don’t go anywhere now without there being a bike race to be in,” she said. Whatever she does, Tingey is going to do it with enthusiasm. After all, this career as a professional mountain biker wasn’t something she planned. It just sort of happened after her husband challenged her to enter a race – a race she won.